Does he? Or will that just hold him back? There are times when you need everything to line up just right to succeed, but even when they don't a good time is still had. 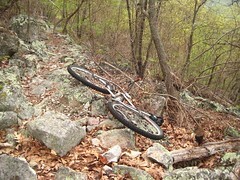 Thats what I was thinking while I was crashed out on the rocks, hanging sideways and unable to get up, clipped in and partially suspended downhill on the Massanutten Trail, a.k.a. "The Ring". Twenty-one miles into the ride, 5000 ft. of climbing and I knew our goal, the entire 71 mile gnarly, rocky mess, was not going to be met. We were descending Short Mountain, a section generously described as a trail and something we had yet to ride until today, and even though we had heard horror stories of it's difficulty, we weren't prepared for the serious amount of time we were going to lose in this section. Two hours and forty-five minutes to cover 8 miles. Up until this time we were on pace to cover the ground we needed to on day one. 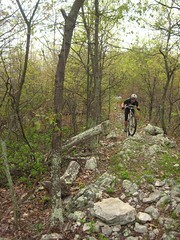 On paper, a little over 35 miles of trail per day should be cake, or at least easily achievable. 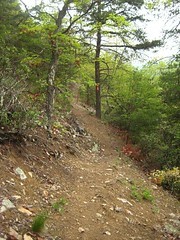 In reality this trail puts demands on rider and equipment like few trails do. Hell, trying to get anyone to attempt the whole thing with me isn't easy, it seems to scare a lot of people off. Luckily I had long time riding partner Jay with me, always up for a challenge and a great person to road trip with. When we arrived at dusk on Friday we found the Camp Roosevlet campground not yet open for the season. 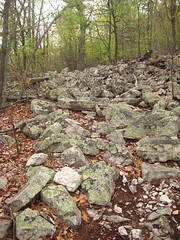 We quickly searched out a spot in the nearby woods that would serve as a suitable base camp. As soon as I went to unpack the car I realized I forgot a large box containing my tent, sleeping bag, stove, etc. This is how it's going to start, eh? A sleeping pad and pillow in my possession, Jay generously shared tent and equipment to keep me from suffering too much. Luckily I had my food and all of my bike gear, so I just had to reset my head and forget about the big mistake I made to start the trip. Dinner and a few beers and we crashed out, ready to tackle the challenge in the morning. The plan was to drive to the start of the loop, leave the car, bike half of "The Ring" on day one, crash at our camp and complete the loop on day two, picking up the car for the return trip to camp. Early morning gear shuffling, some breakfast and we were on the road north towards Mudhole Gap with a light rain. Not a good sign as we arrived at the start and the rain got steady. We waited it out for a bit and by the time it stopped and we hit the trail it was 9:30. The initial climb was steep and the wet rocks and roots weren't welcome but spirits were high and by the time we hit the ridgline conditions were already improving. Temps were warming up quick and we headed south full of determination, slicing and dicing the dirt and dancing on the rocks. We hit Woodstock Tower making good time, crossed and hit trail that was new to us, a section that earned high marks and finished with a couple of miles of some of the finest descending I've done in that area. At Edinburgh Gap we took a quick break for lunch and a map check. Time calculations had us on pace but we knew Short Mountain was next and would probably slow us down a bit. A mix of riding and hike-a-bike, then some sweet rolling benchcut singletrack with spectacular views before we hit more climbing. And more climbing. And a little more before topping out on the ridge and then traversing the slowest, rockiest type of trail we had yet to see. On the bike - off the bike; that was the program for the next 2 hours. 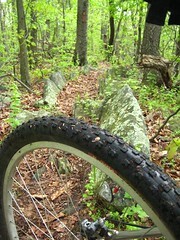 Great views, relentless terrain, slow progress. When we finally get to the end of the ridge and start to descend: fast, rocky, stuff that sometimes does not resemble a trail. Earlier on the ridge, I've done the math. Our day one goal is out of reach before dark. Short Mountain has stuck a fork in us. Throughout the day I was holding back a little, pacing for the long haul, dial the knob back to 9 instead of 10, don't want unnecessary flats, don't need an injury. But now, all bets are off and I'm letting it rip, making the most of gravity. I plan to get all I can for my money, that slow ridgetop traverse, the snail-like pace it imposed on us, I want revenge, I want some fun, I want some speed. Feeling good on the tech stuff but admittedly the body is feeling some fatigue and then a mistake. And then a second mistake and we are where this story began, banged up and hanging in a weird position, unable to easily extract myself. I thought Jay was right behind me, but I have to wait it out a bit. And then get his call out (insult?) of "rider back" as he approaches. 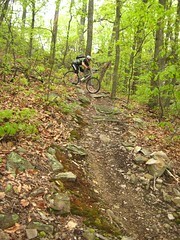 I have to laugh, it's been a great day, beautiful trails, no valid complaints. Even if I'm in a bit of a precarious position and our goal of completing The Ring this weekend is shot. Once extracted, we continue to rip down the mountain. 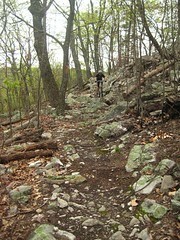 Quick food stop, map check, another mile or so of trail and we hit our bailout point. Four or five miles of gravel forest road, all downhill thankfully, and we are back at camp. Beers cracked, food gourged, fire wood collected. More beer, camp fire and then waking up to rain in the middle of the night. Morning comes and the rain hasn't stopped. It comes int waves, steady then heavy, never light. Coffee, food, waiting. Temps have dropped, hypothermia on the mind. Eventually we gear up and head out, 19 miles of rain riding to go retrieve the car. Not as bad as we thought. Dry clothes in the pack, beer cooler smartly left in the car, then back to break down camp and start plotting, doing the math and figuring out how our next attempt at tackling The Ring will go. Because this is attempt #2 and we aren't ready to give up yet.